The Shel Labs Hybridization Oven provides a digitally controlled convection heating and even rotation for hybridization workflows. This RNA and DNA hybridization oven is flexible, letting users customize speed and temperature to suit their applications. This rotisseries style lab oven has a microprocessor-controlled heating system, with touch key pad navigation and a temperature range of between 5 above ambient to 70°C. 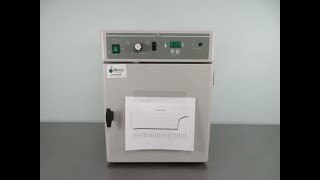 Inside this lab incubator is a rotisserie style sample holder built to provide consistent rotation that’s adjustable between 2-20 RPM. This Hybridization oven has an easy to clean stainless interior, a durable finish on the exterior and a compact footprint letting you fit it easily on your workbench. With this hybridization oven is a Agilent Microarray Slide kit, constructed of long lasting stainless steel for an exact fit. Amb. +5 to 70C in 7 min. This Shel Labs Hybridization Oven has been fully inspected and is operating without issue. All of our lab equipment comes backed with our standard warranty. Should you have any questions about this or any of our other incubators, please don't hesitate to contact us, we're here to help!